Bitcoin IRA investing officially became a thing in 2017. Yes, it’s possible to buy bitcoins in your IRA. In fact, there are several ways to do it. Today, we’re explaining the basics of investing in bitcoin in your IRA. We’ll also help you decide if it’s a safe investment. If you’re wondering whether a bitcoin IRA is a safe investment, then you’re probably concerned about several things. The first and most important thing is determining whether or not you can even legally purchase a bitcoin IRA. Some people mistakenly believe that IRAs are limited to stocks, mutual funds, and other common assets like gold. However, it’s easier to list the things that aren’t allowed in an IRA. You’re allowed to invest virtually anything in an IRA. The only assets explicitly prohibited by law are life insurance and collectibles. That’s it! Bitcoin is not a collectible, and it’s certainly not life insurance. As far as the IRA is concerned, bitcoin is just another asset that can legally be placed in your IRA. That being said, the IRS has not officially endorsed bitcoin IRAs – despite what bitcoin IRA sellers online want you to believe. As of January 2018, the IRS has neither prohibited nor endorsed bitcoin IRAs. So you can buy bitcoin in your IRA. What’s the catch? The catch is that most IRA accounts are considered “captive accounts”. That means you can only invest in investment options directly offered by the IRA company. Many IRA companies do not offer bitcoin to clients. If that’s the case with your company, then you have a backup option: self-directed IRAs. A self-directed IRA is identical to a captive IRA with one major distinction: captive IRAs limit your investments to assets sold by the IRA company itself. Self-directed IRAs, meanwhile, allow you to invest in any asset not explicitly prohibited by the IRS – including bitcoin. Once you have a self-directed IRA, then you’ll need to setup a wallet under that IRA. Contact your self-directed IRA custodian to learn how to do this. Some custodians require you to setup a wallet under the name of the IRA. Others require you to establish a corporation (an LLC) within your IRA to hold your bitcoin wallet. Is It Safe to Work with a Bitcoin IRA Provider? Setting up a self-directed IRA with your own bitcoin can be a pain. If you search for “bitcoin IRA” online, you’ll find plenty of providers willing to take your money. Are any of these companies safe? Do they offer a legitimate service? These bitcoin-oriented IRA providers all typically work in a similar way. They allow direct ownership of your IRA, but they charge exorbitant commissions of 15% or more of your IRA balance. Before locking into any investment with a bitcoin IRA provider, make sure you fully understand their fee structure. If you find a reasonably priced provider, then you may want to take that offer. After all, setting up a corporation under your own self-directed IRA can cost more money than you’re willing to spend. Is Bitcoin a Safe IRA Investment? Consider your investment goals: how will you use your IRA? When will you withdraw the funds? Bitcoin may be worth $500,000 in 50 years when you retire. Or, it could be worth $0 within 5 years when you need money for a down payment on your house. Ultimately, it’s easier than ever to open a bitcoin IRA. 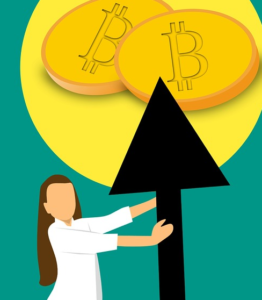 Bitcoin IRA investing isn’t explicitly prohibited or endorsed by the IRA – so there are no safety concerns in that regard. It’s up to you to decide whether or not a bitcoin IRA investment is a safe choice based on your unique investment goals.